The Battle of Poitiers was fought between the Kingdom of England and France on September 19, 1356, resulting in the second of the three great English victories of the Hundred Years' War. The king of France was captured and ransomed but the ransom was not paid. Kingly power had started to be accompanied by Parliamentary power as nations emerged as entities other than the personal jurisdictions of monarchs. The Hundred Years’ War stimulated the development of Parliament in both nations. On August 8, 1356, Edward, the Black Prince began a great chevauchée (raid) north from the English base in Aquitaine, in an effort to relieve allied garrisons in central France, as well as to raid and ravage the countryside. His sortie met little resistance; his Anglo-Gascon forces burned numerous towns to the ground until they reached the Loire River at Tours. His army was unable to take the castle or burn the town due to a heavy downpour. His delay there allowed John II of France (1319-1364) to attempt to catch his army and eliminate it. The king, who had been confronting John of Gaunt, Duke of Lancaster (1340-1399) in Normandy, arranged the bulk of his army at Chartres to the north of the besieged Tours, dismissing around 15,000–20,000 of his low-grade infantry to increase the speed of his forces. This made the two armies surprisingly similar in size, an unusual occurrence in the Hundred Years’ War. Upon receiving reports of the French army on the move, Edward decided a retreat was in order. He marched south pursued in earnest by John. The French caught up to the English a few miles southwest of Poitiers. 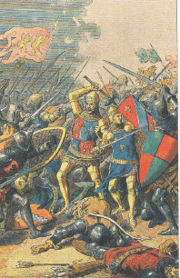 A veteran of the battle of Crécy, at which he had fought when he was only 16 years old, Edward decided on the same tactical scheme employed at that earlier battle. He positioned his troops in a strongly defensive position, in a plain surrounded by natural obstacles, such as a creek on the left and a wood on the back. The luggage wagons, with a great amount of plunder, remained along the old Roman road, the main route from Poitiers to Bordeaux, to give protection to his weak right side. All his men dismounted and were organized in two, perhaps three units, with the Welsh-English longbowmen placed in a V-formation on both flanks. Edward kept a small cavalry unit, commanded by Jean de Grailly, the Captal de Buch, hidden in the woods at the rear. The attacking French forces were divided in four parts. At the front were around three hundred elite knights, commanded by General Clermont and accompanied by German mercenary pikemen. The purpose of this group was to charge the English archers and eliminate the threat they posed. These were followed by three groups of infantry (dismounted cavalry) commanded by the Dauphin (later Charles V of France), the Duke of Orléans and King John. At the beginning of the battle, the English simulated flight on their left wing. This provoked a hasty charge by the French knights against the archers. However, they were expecting this and quickly attacked the enemy, especially the horses, with a shower of arrows. Froissart writes that the French armor was so invulnerable to the English arrows that the arrowheads either skidded off the armor or shattered on impact. The armor on the horses, however, was weak on the sides and back, so the English archers moved to the sides of the cavalry and shot the horses in the flanks. The results were devastating. This attack was followed by the Dauphin's infantry, who engaged in heavy fighting, but withdrew to regroup. The next wave of infantry under Orléans, seeing that the Dauphin's men were not attacking, turned back and panicked. This stranded the forces led by the king himself. This was a formidable fighting force, and the Welsh archers were out of arrows: the archers joined the infantry in the fight and some of both groups mounted horses to form an improvised cavalry. Combat was hard, but Edward still had a mobile reserve hidden in the woods, which were able to circle around and attack the French in the flank and rear. The French were fearful of encirclement and attempted to flee. King John was captured with his immediate entourage. King John had to be ransomed back by the French. The English demanded a sum that was the equivalent of half of Frances' annual income. He died as a prisoner in England. The French also had to accept the terms of the Treaty of Bretigny (1360), which ended the first phase of the Hundred Years’ War. The treaty ceded extensive territories in the North to the English. Hostilities recommenced in 1369. Edward III of England renounced his claim to the French throne. Although the French troops only slightly outnumbered the English, the battle would enter the British mythos as one in which its skilled bowmen out maneuvered the French to rescue victory from the face of defeat. ↑ Amt, Emilie (ed.). 2001. Medieval England 1000 - 1500: A Reader. Peterborough, Ontario: Broadview Press. ISBN 1551112442. p. 335. Amt, Emilie (ed.). Medieval England 1000 - 1500: A Reader. Peterborough, Ontario: Broadview Press, 2001. ISBN 1551112442. History of "Battle of Poitiers"
This page was last modified on 19 May 2016, at 15:17.